Georgia’s State Security Service has addressed the country’s Ministry of Internal Affairs to prevent the use of Soviet or totalitarian symbols during a pre-election gathering by a pro-Russian political party later today in Telavi. The State Security Service said the leaders of the party Public Movement-Socialist Georgia, led by Valeri Kvaratskhvelia, could not use the Soviet symbols during the gathering in Telavi, dedicated to the October 8 parliamentary elections, as it would be a violation of Georgian legislation. The state body demanded that the Interior Ministry prevent this, and in case of resistance apply all legal measures against the perpetrators. The state commission established to oversee the enforcement of the Liberty Charter operates under the State Security Service and includes members of Parliament. The Liberty Charter, adopted in 2010 and amended in 2013, prohibits public displays of Soviet and Nazi symbols. Any violation will carry a financial penalty of GEL 1,000. In response, Kvaratskhelia said what the Government saw as Soviet symbols were working weapons for him on which the states’ welfare stood on. He said if the state bodies acted aggressively it would trigger negative consequences for the Government, as his party enjoyed “substantial public support”. 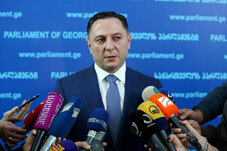 In his comment for local media, Kvaratskhelia condemned Georgia’s Euro-Atlantic striving and stressed Georgia could benefit only through cooperation with Russia. The party has held two indoor gatherings over the past month – in the town of Gori, Stalin’s hometown, in late June and then in the coastal city of Batumi on July 27, which were accompanied by the Soviet anthem and Soviet flags.